Why All The Fuss About Fleas? Flea allergy dermatitis (FAD), or fleabite hypersensitivity, is an allergic skin disease syndrome affecting dogs and cats. Most non-allergic dogs and cats can receive a few flea bites here and there without any significant itching, however animals with FAD cannot tolerate even the most minimal flea exposure. Dogs and cats with FAD experience a severely itchy allergic reaction after exposure to antigens in flea saliva, when the flea bites the animal. The exact amount of flea exposure required to trigger an allergic reaction likely varies between individual animals, but we know that it does not take a heavy flea burden to elicit signs of FAD. In fact, owners of many flea allergic patients have never actually seen fleas on their pet. Flea allergy dermatitis is not the same thing as flea infestation! FAD usually shows up in dogs and cats by the time they reach middle age, however it is possible to show up later in life. The typical symptoms of FAD include intense itching, focused mainly on the back half of the animal’s body. This can include the hind legs, tail, rear paws, flanks, groin, abdomen, and lower back regions. Sometimes the neck and sides of the face are involved as well, particularly in cats. Over time, symptoms can even become generalized and involve most of the body. With all of the scratching/licking/chewing comes hair loss, redness, and sometimes rashes, scabs, or flaky skin. Diagnosis of flea allergy dermatitis is mostly based on historical information and clinical symptoms, but other causes of itchy skin disease are often ruled out as part of the diagnostic process. 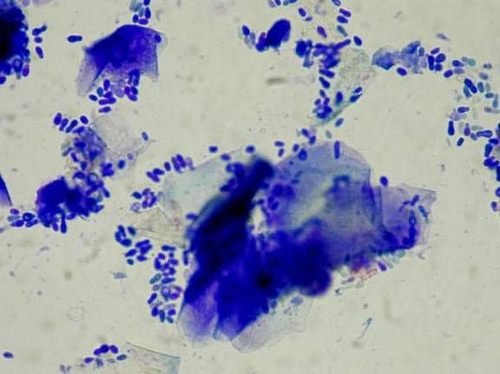 Yeast and/or bacterial skin infections often develop secondary to all the itchy behaviors associated with FAD, so cytology to look for yeast and bacteria will typically be performed. Skin scrapings to look for mites may also be a part of the diagnostic workup. Treatment of FAD revolves around minimizing flea exposure for the patient. Cats and dogs with FAD need to be receiving top of the line veterinary flea preventatives on a regular basis, year round! Adult fleas can emerge from weather-resistant cocoons (pupae) any time the temperature gets above the mid 50’s (Fahrenheit). In most areas of California these temperature conditions can occur year-round. Also, the interior of our homes are kept at temperatures in which flea populations could thrive during all months of the year. Another essential component of treating FAD is often overlooked… other pets in the family must also be part of the FAD treatment regimen. Unless they are also on year-round flea preventative medication, other pets can serve as a source of flea exposure for the allergic pet. More information on flea life cycles and environmental cleanup can be found on the following website: http://www.drmichaeldryden.com/fleas/. So, next time you hesitate in treating your itchy dog or cat for fleas, just remember that these often unseen pests can cause a huge problem for allergic animals! All flea control medications are not created equal, and the doctors here at Animal Dermatology & Allergy can provide guidance on the best flea control choices for our patients and their families.